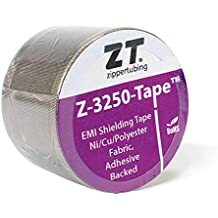 Zip Mesh Al - Zip Mesh - Trade Names - ZT | Zippertubing Co.
Zip-Mesh® is a flexible, easy-to-use EMI Shielding tape of two-ply, woven Tinned-Copper mesh, separated by either Aluminum or Copper polyester tape, with a self-adhesive material on one side. The material offers very low electrical resistance and is intended to compliment Zippertubing&apos;s "SH1" Foil and "SHX" Series of knitted wire mesh EMI Shields. The tape allows joining of EMI-Shielded jacket sections at cable splices, branchouts and the transition to connector hardware. The standard tape width is 1.0 inch with other sizes available on a custom basis. This product has an operational temperature range of -40° to 175°C (-40° to 347°F). Zip-Mesh® (Al) is a flexible, easy-to-use EMI Shielding tape of two-ply, woven Tinned-Copper mesh, separated by Aluminum polyester tape, with a self-adhesive material on one side. The material offers very low electrical resistance and is intended to compliment Zippertubing&apos;s "SH1" Foil and "SHX" Series of knitted wire mesh EMI Shields. 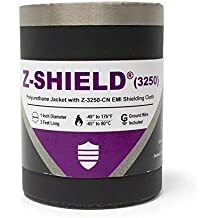 The tape allows joining of EMI-Shielded jacket sections at cable splices, branch-outs, and the transition to connector hardware. The standard tape widths are 1.0 and 2.0 inches with other sizes available on a custom basis.